Whether you’re a secret shower singer, a karaoke nut or you just want some good harmony in your life – Feel Good could be for you. 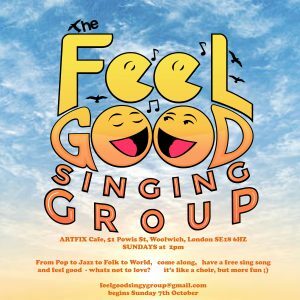 It’s a new regular singing group to sing away the stresses of the week with feel-good songs for everyone ranging from pop to jazz to folk to world. Come along for free and enjoy the benefits of singing in a group, scientifically proven to be good for your health: from getting more oxygen into the blood, to increasing the flow of feel-good hormones and improving mental health. Feel free to email us and let us know if you’re a shy sort, a football singer or an amateur opera diva and tell us 3 of your favourite songs, you never know, we might do one with the group! The Feel Good singing group is run by Jami Reid-Quarrell. Jami has sung with Choir of Man, London Dixieland Jazz Band, Angels of Kaos and his own band Katts&Dawgs among many others.